Have you set goals for your photography for 2017? Do they include being more creative with your images? Learning new techniques? Exploring iPhoneography/Digital Art? If you answered yes to any of these questions, then you should consider attending the Creative Photography Conference that is being hosted by Meredith Images in May. 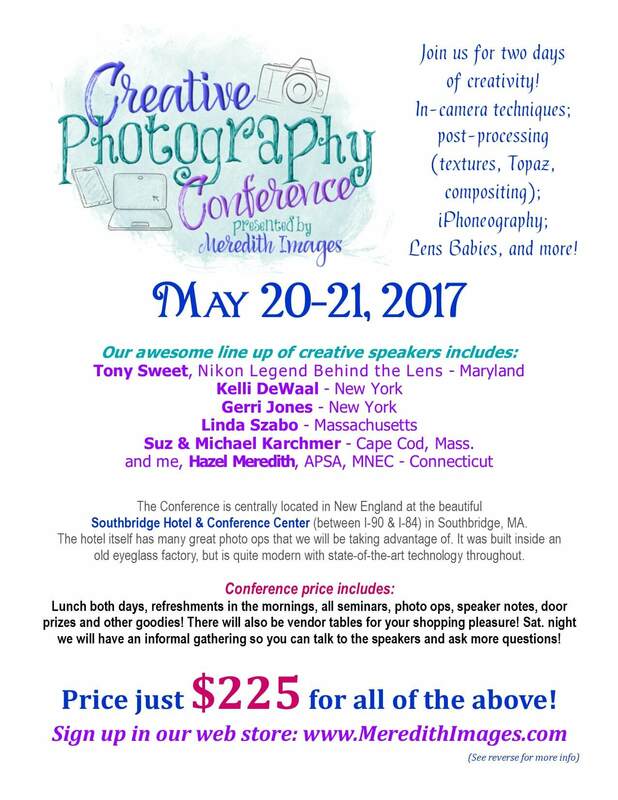 The conference will be held in Southbridge, Massachusetts on May 20-21, 2017 at the Southbridge Hotel & Conference Center. I am happy to say that I am one of the creative speakers and would love to have you join us for two days of creativity. There will be in-camera techniques, post-processing (textures,compositing, and Topaz), iPhoneography, Lens Baby Lenses and more. Suz & Michael Karchmer – Cape Cod, Mass. The conference price includes lunch both days, refreshments in the mornings, all seminars, photo ops, speaker notes, door prizes and other goodies! There will be vendor tables for your shopping pleasure as well. Saturday night we will be having an informal gathering where the speakers will be available to answer your questions. The price for all of the above is a very reasonable $225. If you are interested in joining us and furthering your photography skills this year, please visit http://meredithimages.com to register. There is a block of rooms reserved for the conference as well, which will provide you with a savings on your accommodations. 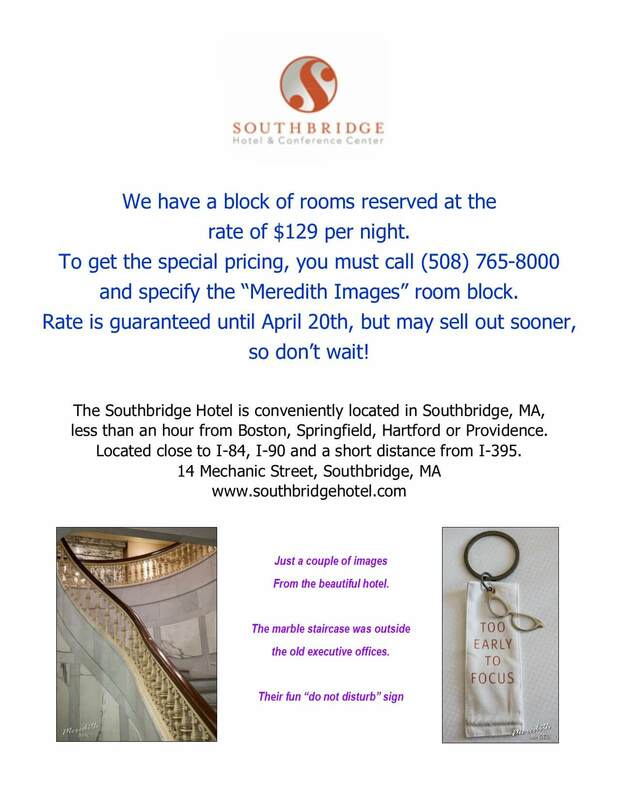 To get this special pricing, call 1-508-765-8000 and ask for the “Meredith Images” block. The special rate of $129/night is available if you call prior to April 20, 2017. However it may sell out sooner, so don’t wait, call today. We would love to see you there. Oh My Goodness! I would LOVE to do this and the price is so reasonable! Will be discussing with my husband over the weekend.